If you need a reminder of just how passionate and amazing book fandom can be, a Cassandra Clare signing is the perfect place. Chloe had the pleasure of representing Fangirlish and TMI Source at Clare’s Lady Midnight launch event in Los Angeles last week, and it was a true event in every sense of the word. Cassie and her friend/fellow fabulous author Holly Black arrived at The Grove in a custom Lady Midnight tour bus. Fans arrived hours early to score wristbands for the signing and pick up copies of the new book, which kicks off The Dark Artifices series… and sold out well before go time. Many of the stars of Shadowhunters, the Freeform show based on Clare’s Mortal Instruments series, even made an appearance to join Cassie in a Q&A and support the book launch. Needless to say, there was a lot of excitement in Barnes & Noble that day for all fans of Cassandra Clare’s binge-worthy books. But beyond the thrill of meeting Cassie and getting books signed, I was lucky enough to go behind the scenes for an unbelievable Shadowhunters experience. Before the signing, I joined several other superfans/members of press for a once in a lifetime experience: live tweeting an episode of Shadowhunters with the cast of the show. We got to hang out in a back room at Barnes & Noble with Kat McNamara, Emeraude Toubia, Harry Shum Jr., and Isaiah Mustafa while we all enjoyed snacks from Sprinkles and Dylan’s Candy Bar, chatted on commercial breaks, and live tweeted up a storm for the worldwide trending #ShadowhuntersChat. I can’t say that I’ve ever live tweeted a show with the cast before, and it was such a fun experience. From Kat showing Harry funny fan tweets and gifs on her phone to everyone taking selfies for Twitter (some of which we unintentionally photobombed – oops!) and reacting to the episode, it was definitely an interesting way to see the latest Shadowhunters installment. When the episode was over, we rejoined the many, many other fans in the building for the main event: a Q&A with Cassie and the cast, moderated by Holly. The fans – some of whom had traveled from places like Brazil and Venezuela to be there – asked such thoughtful questions, and we got to learn some fun tidbits about the books and the show. For some of their answers, check out our Twitter! After the Q&A, we rejoined the cast for interviews. 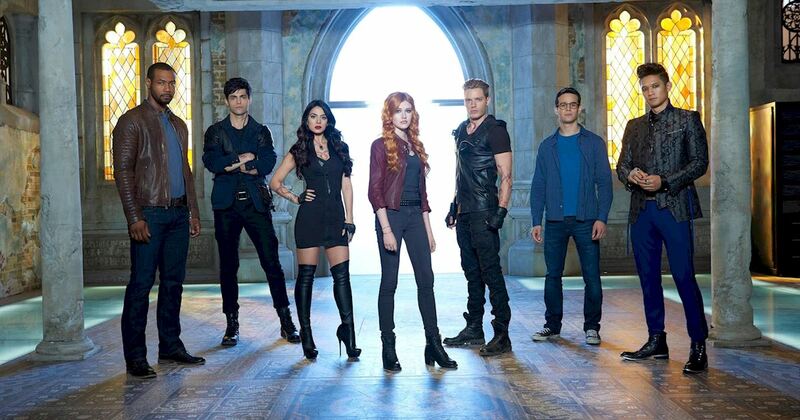 I got to talk to them about everything from what we should expect from the rest of the season and what they love most about interacting with their fans online to what they would like to see from their characters if Shadowhunters were to be renewed for a second season – which now it has been! Kat, Emeraude, Harry, and Isaiah were so lovely and open, and they revealed some great stuff about the show. Watch the full interview above! Of course, I couldn’t leave without chatting with the lady of the hour, Cassandra Clare herself. Cassie was so incredibly sweet as she signed my books and posed for a picture. It’s always a pleasure to see her, and I’m so glad we were able to support her and join in the fun for the Lady Midnight celebrations. Catch her on tour if you can, and enjoy Lady Midnight! Lady Midnight is now available to buy, and you can watch Shadowhunters Tuesdays at 9/8c on Freeform.